green house and from the farmers’ market. How do you decide what to grow? everywhere – and I only had 2 plants! 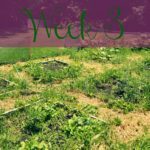 I think the first part of figuring out what to grow is what will your family eat? until August when I completely give up the weeding). I start to make my list of what I want to grow. up eating everything we grow, and that is a good thing in my book. to start writing out where I can put everything. they are, and what plants will be going in each of them. that we can expand our garden just a bit more. bit of fruit for very minimal labor. We had a garden years ago. I'm really not very good with plants and gardening. These are great tips! I need to try and be better this year. I have the worst green thumb!! 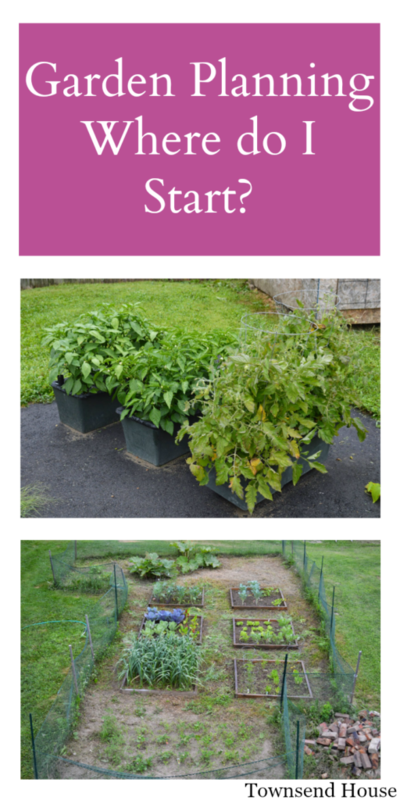 These are great tips for starting your garden! I have my little seedlings growing in my greenhouse right now! Great way to grow your own foods. We are planning the same in our yard. I love how it turned out. I think its so much fun to see your hard work grow. I dream to have a garden someday when we finally choose the country to live in! I'd have so many flowers and trees in blossom! The earth box sounds like a winner and something I can really make use of! Isn't it funny how kids will eat what they've helped grow…. I think that is my favorite part of gardening these days! Gardening is something I keep telling myself I need to get into!!!! Maybe this year will be the year I make the garden happen! We great veggies for a couple of years, till the squirrels found them and ate everything. Seriously EVERYTHING, even the stems. All I had of my squash plants were little stem nubbins sticking out the ground! My husband is a fan of peppers, carrots and herbs. WE've had a few accidentally things like pineapple and watermelon from spitting out the seeds, or just sprouting from the compost pile. I don't have a green thumb, but I enjoy organic and garden fresh! I need to check out the EarthBox. I don't have a green thumb at all but would love to grow some tomatoes. I would love to have a garden one day. I always loved being in my moms and eating fresh green beans. Yum. Very helpful post! When it comes to planting anything I simply gave up because everything I plant just seems to die. I would however like to give it a try this year and see if maybe my luck has changed. 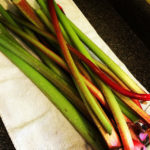 Gardening posts are always a sign that Spring is here! I'm not a gardener but I sure do enjoy looking at all the hard work that is put into one! This post is so enduring for Spring, while it could possibly start snowing again in Chicago at any moment. We do a city garden which can be a little tricky but usually works out very well. 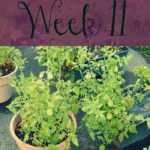 I love to try new veggies in my garden but a few things are a must, tomatoes, basil, cilantro. I love my little garden. I have to start from scratch this year! The house we just moved in to doesn't even have a plot of any kind! Wish me luck! My goodness, it really is that time of year again. Now that the snow has melted, I need to get out there. Thanks for the tips. I love live having a garden ita so fun and the kids love to gather what we grow my husband does the hard work but it's awesome ! Gardening is great i love getting out and doing some….the only thing is gardening doesnt like me. I get them to the point where they pop out of the ground then boom, dead lol Great information and thanks for sharing. Maybe next spring I'll get it right ? I used to love helping my foster mum garden when I was a teen/kid. There is something so therapeutic about planting. We have had a large vegetable garden for as long as we had children. They have always been involved the best they can be. I know this is why they LOVE their veggies now at 9 and 12! The 9 year old is a bit pickier but I can usually, eventually, get him to try almost any food. It's always gardening season here in Hawaii, which is so nice. 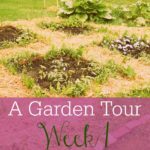 When we first started I was really overwhelmed, but once we got into the swing of things with our pallet garden, it was wonderful! Fresh herbs and spices are the best! I have a small flower bed in the front of the house for flowers and such but the back will be a place for fruits and veggies. We have a while to wait before we can get started. Theres always a threat of frost before the long weekend in May. We've done gardens for years but last year we gave up. Didnt do one. Its like another full time job to keep it up and keep those deers away from it. One year we are ALL set and were about to harvest, and that day the deer ate everything. So… now we go to Farmers Markets! Deer are the only pest that I have yet to deal with. Last year we didn't have a garden, but the previous year we had one that the woodchucks decimated…we ended up having to dispose of 8 woodchucks that year. I'm a little afraid of what this year will bring! The dreaded shade! Yes, that is a tough one to conquer! I am all for the farm stands, and you are lucky you have one so close! I'm definitely getting excited for garden season! I tend to pick the veggies that we've had the most successful are and that gives us the most bang for our buck! Squash, zucchini, tomatoes,, cucumbers and peppers are our favorites. Last year we threw at eggplant in the mix and had great luck!